The Great New Orleans Kidnapping Case irresistibly combines intrigue, atmosphere, and scholarly command of the Reconstruction Era—shown here to be a period of promise (bought dearly in the Civil War) too soon yielding to the retrograde actions of Jim Crow. But was our nation’s biggest missed opportunity—to consolidate the gains of the first major civil rights movement after the Revolution itself—inevitable? Read the full review in Publishers Weekly. More raves at oup.com. On publication in June 2014, The Great New Orleans Kidnapping Case was written up in the New York Times by Jennifer Schuessler, prompting Anne Rice to share a Facebook post with a link to the book’s Amazon page, attracting 1.1 million Likes and propelling the book to #389 on Amazon.com. Michael A. Ross is an associate professor of history at the University of Maryland in College Park. His first book, Justice of Shattered Dreams: Samuel Freeman Miller and the Supreme Court During the Civil War Era (LSU Press, 2003), was hailed by James M. McPherson as a “splendid biography [that] will greatly enhance our understanding of the era.” The book won the George Tyler Moore Civil War Center’s Seaborg Award for Best Civil War Non-Fiction (2004), and the Association of Jesuit Colleges and Universities Alpha Sigma Nu Book Award (2005), awarded once every three years for the best history book authored by a faculty member at a Jesuit institution (Dr. Ross was then affiliated with Loyola University in New Orleans). Dr. Ross’s articles have appeared in the Journal of Southern History, Journal of Women’s History, Journal of Supreme Court History, Civil War History, and he reviews books regularly for the New Orleans Times-Picayune. In 2007, he delivered the Leon Silverman Lecture at the United States Supreme Court. In June 1870, the residents of the city of New Orleans were already on edge when two African American women kidnapped seventeen-month old Mollie Digby from in front of her New Orleans home. It was the height of Radical Reconstruction, and the old racial order had been turned upside down: black men now voted, held office, sat on juries, and served as policemen. Nervous white residents, certain that the end of slavery and resulting “Africanization” of the city would bring chaos, pointed to the Digby abduction as proof that no white child was safe. Louisiana’s twenty-eight year old Reconstruction Governor Henry Clay Warmoth, hoping to use the investigation of the kidnapping to validate his newly integrated police force to the highly suspicious white population of New Orleans, saw to it that the city’s best Afro-Creole detective, Jean Baptiste Jourdain, was put on the case, and offered a huge reward for the return of Mollie Digby and the capture of her kidnappers. When the Associated Press sent the story out on the wire, newspaper readers around the country began to follow the New Orleans mystery. Eventually, police and prosecutors put two strikingly beautiful Afro-Creole women on trial for the crime, and interest in the case exploded as a tense courtroom drama unfolded. In The Great New Orleans Kidnapping Case, Michael Ross offers the first full account of this event that electrified the South at one of the most critical moments in the history of American race relations. Tracing the crime from the moment it was committed, through the highly publicized investigation and sensationalized trial that followed, all the while chronicling the public outcry and escalating hysteria as news and rumors surrounding the crime spread, Ross paints a vivid picture of the Reconstruction-era South, and the complexities and possibilities that faced the newly integrated society. Leading readers into smoke-filled concert saloons, Garden District drawing rooms, sweltering courthouses, and squalid prisons, Ross brings this fascinating era back to life. 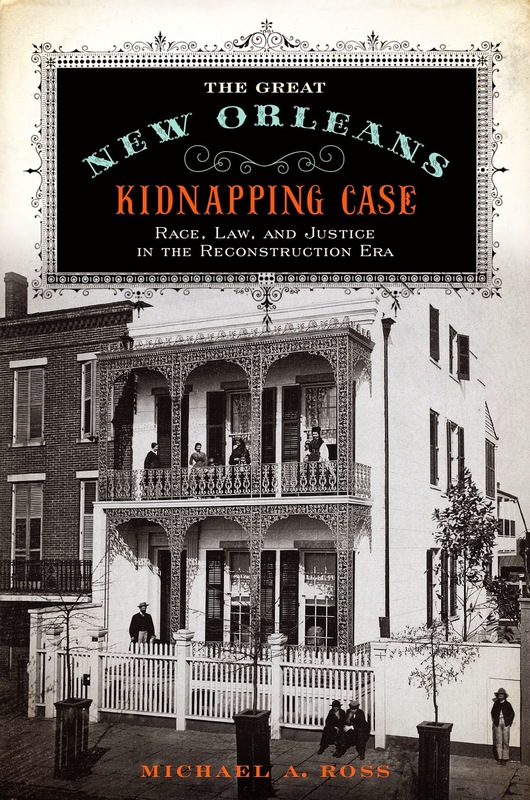 A stunning work of historical recreation, The Great New Orleans Kidnapping Case is sure to captivate anyone interested true crime, the Civil War and its aftermath, and the history of New Orleans and the American South.